Illinois ranks 36th in the latest Tax Foundation's State Business Tax Climate Index, which measures the impact on business of five major elements of the tax system: the percentage of income taken by all taxes, the individual income tax rates, the corporate income taxes, the sales tax rate, and the complexity of the tax system. Illinois has a MORE ATTRACTIVE TAX CLIMATE FOR BUSINESS than neighboring states like Ohio and Minnesota. In fact, Illinois’s tax rank is BETTER FOR BUSINESS than some southern states as well, including: Alabama. Louisiana, Arkansas. Illinois’ individual income tax burden has consistently ranked below the national average. Tax Foundation Report on State Business Tax Climates. Income earned in Illinois or received by Illinois residents is taxed at 4.95 percent. Partnerships and S-Corporations pay a 1.5 percent personal property replacement tax and S-corporations’ owners pay the 3 percent personal income tax on their share of the corporation’s income. Corporate income apportioned to Illinois is taxed at 9.5 percent, which includes a 7 percent state income tax and a 2.5 percent personal property replacement tax (S-corporations pay 1.5 percent) A unitary group of corporations files a combined return in Illinois. Corporations with more than 80 percent of their payroll and property outside the United States are NOT included in combined returns. Corporations with unique apportionment formulas are not included in combined returns. Credits include a 0.5 percent credit for investment in mining, manufacturing or retailing, plus an additional 0.5 percent if employment increases over 1 percent. Other incentives may also be available depending on location, business and employment. Interest on Loans to Enterprise Zone businesses are deductible. Retail purchases of tangible personal property are subject to a state sales tax or use tax rate of 6.25 percent. *If the vehicle or trailer is titled and registered to an out-of-state location, you (the dealer) may be required to collect tax. Refer to ST-58, Reciprocal - Non-Reciprocal Vehicle Tax Rate Chart. Local sales tax rates vary. Food and drugs are taxed at the reduced rate of one percent. 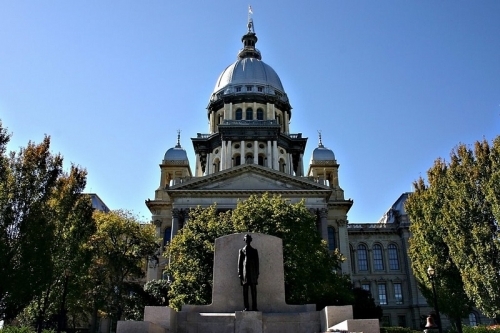 Illinois imposes an annual franchise tax on both Illinois corporations and non-Illinois corporations for the privilege of doing business in the State. You calculate the corporation franchise tax by multiplying your corporation’s paid-in capital by the franchise tax rate of 0.1%. However, even if your corporation has no paid-in capital, you are still going to have to pay a minimum $25 franchise tax fee, annually. The maximum annual franchise tax is $1 million. The franchise tax is paid with the required corporation annual report, along with a filing fee of $75. Capital Stock Tax Rate in Illinois is 0.100 with a maximum payment of $2,000,000. Both CST and CIT payments are required. Illinois imposes a tax on those in the business of selling, distributing, supplying or furnishing electricity or natural gas for use or consumption. The telecommunications tax is 7 percent. The electricity tax is 5 percent of 0.32 cents per kilowatt hour, whichever is lower. The natural gas tax is 5 percent or 2.4 cents per therm, whichever is lower. Some local governments also collect utility taxes. There is no State Property Tax in Illinois. Local Property taxes are the primary source of income for all Illinois school districts. Taxes are levied per $100 of equalized assessed value (EAV) Assessments are based on market value, and vary based on County, and by residential, commercial or industrial use. Tax rates average approximately 7.82 percent of assessed value statewide. Property taxes are assessed for the County, Village, Library District, Township, Elementary School District, High School District, Community College District, and Park District. Please call the North Central Illinois Economic Development office at 815-224-0645 to determine the property tax rate at any particular address or location. Illinois does not collect a state property tax on real estate or personal property. All property other than real estate is exempt from the property tax in Illinois. Thus, all classes of personal property, including machinery, equipment, inventories, and intangibles, are exempt. Pollution controls are assessed at salvage value (lacking any economic productivity) rendering them essentially exempt from the property tax. Property tax Tax Increment Financing Zones (TIFs) are used in Illinois to promote development. 16 cities in North Central Illinois have established TIF districts. Most of the industrial property in the region is in a TIF zone. An unemployment compensation tax is applied to the first $12,960 in wages paid to each employee annually. A “new employer” rate applied for the first 3 years of operation: after 13 months experience in Illinois, an “experience-adjusted” rate is calculated. When an employed has been in business in Illinois at least 13 months, but less than 36 months, that employer pays the higher of the two rates; after 36 months, the employer plays its “experience-adjusted” rate” The 2017 New Employer rate is 3.45 percent. Adjusted rates may vary from 0.7 percent to 8.6 percent. Employers who have incurred liability for the payment of contributions within each of the three or more years immediately preceding 2009 will qualify for a variable rate based on their individual experience: Determine the Benefit Ratio, Multiply the Benefit Ratio by the State Experience Factor, and Add the Product to the Fund Building Rate. Workers Compensation Rate Average Reduces by 17 percent in last 2 years! In Illinois, virtually any business that has what could be considered an employee (with over $1,000 in annual payroll) is required to meet their statutory Workers Compensation obligations by either getting an insurance policy, or be being approved as a self-insurer (only practical for large companies) or be becoming a member of a group self-insurance program. The major exception is agricultural enterprises with less than 400 working days of labor during any calendar quarter of the preceding calendar year. Real estate brokers, broker-salesmen, and commission-only sales people are also not required to be covered. Sole proprietors and partners are not required to obtain Workers Compensation coverage for themselves, but they can choose to obtain coverage for themselves. Executive officers of a corporation can opt out of coverage, if they wish, but this must be done by specific endorsement to the policy. Since the state of Illinois essentially requires employers to obtain Workers Compensation insurance or self-insurance, a program has been established to make sure than any employer that needs coverage can obtain it, even if insurance companies do not want to voluntarily underwrite such insurance. That program is the Assigned Risk Plan. Assigned Risk Plan rates are significantly higher than they are in the voluntary market. Such policies have no Premium Discount or Schedule Credits. There is no penalty to leave the Assigned Risk Plan before the policy expires, if you can get an insurer to write your Workers Compensation coverage in the voluntary market. Workers Compensation premiums are calculated by assigning classification to the business operations according to a system devised by the NCCI. Each classification has a particular rate, which is applied to remuneration (the rate is per hundred dollars of remuneration). Premium is further adjusted for companies paying $5,000 or more a year in premium, by application of the Experience Modification Factor. This factor is based on prior loss and payroll data of the particular business. Premium can be further adjusted in the voluntary market with Schedule Credits or Debits, and the application of a Premium Discount factor. After years of increases, the advisory rates have dropped significantly, despite continuing inflation and a growing workforce. After adjusting for inflation, the current rate actually represents more than a 57 percent decrease since 1990. This change is attributed to, among other things, a shifting industrial mix, greater safety efforts, and better medical care.